Does your school, youth group, or business participate in Fundraisers? How about for sports, the arts or even events to raise funds for a family of need in your community? I just found out about a fundraiser opportunity through Equal Exchange Fundraising. They offer your organization products that can support sustainability and award winning products and make a difference in the lives of small farmers and artisans across the globe. What a great idea! The Equal Exchange Fundraiser allows schools and groups to make 40% profit while benefiting small organic farmers and artisans around the globe. 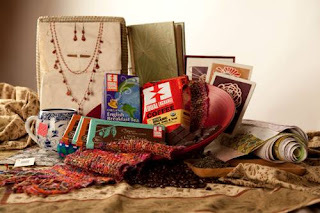 The products that they feature are coffee, teas, cocoas, chocolates, nuts, berries and handmade gift wrap. These are all great items for a fundraiser. What a great way to reinforce social and environmental responsibility! I have tried their Organic Mind, Body and Soul Coffee. It is a Post-Roast Blend of Medium and Vienna Roasts. It comes in a 12 oz bag in Whole Bean or Drip Grind. I love smelling coffee and really tried to find the chocolate aroma but couldn't. I realized that the smell I was picking up was butterscotch. I have never experienced that with a coffee. I find that coffee tasting is a fine art just like wine tasting! I have a long way to go but I do enjoy trying a variety of coffees. This was enjoyable and would make a nice coffee for the mornings. It is a tad acidic but not an issue. I love strong coffee so I used less required water for my brew. This coffee is $9 or $48 for a 6 pack. This would make a great coffee gift for a teacher lounge! The Equal Exchange Fundraising Program started at the grassroots. 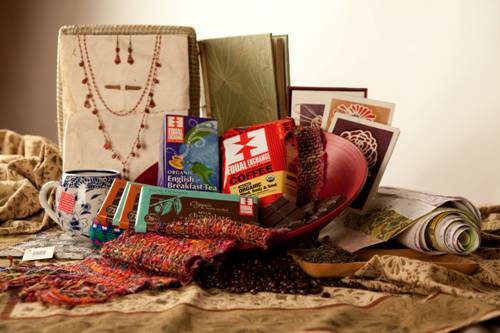 Teachers, parents and students across the country began approaching Equal Exchange's Organizing Department about their interest in a Fair Trade fundraising program. They were ready for a change from conventional fundraisers selling wrapping paper and other knick-knacks from China. These wise parents and teachers wanted a fundraiser that matched their values – one that promotes social and environmental responsibility – with delicious products. In direct response to these inquiries, the Equal Exchange Fundraising Program was born. In 2006, we launched our pilot Equal Exchange fundraiser. Pioneering mothers introduced their PTAs to Equal Exchange with their passion and commitment to making the world a better place, all while also supporting their own communities’ needs. The pilot worked and since then, hundreds of parents and schools have helped grow the program across the country. In 2008, the Program awarded our largest customer the opportunity to be part of our delegation to the Dominican Republic to visit Equal Exchange’s cacao-farming partners, the CONACADO Co-op. The Equal Exchange Fundraising Team also developed a Fair Trade curriculum and pen pal exchange program to help connect US children selling the chocolate with the children of the farmers who grow what they sold. We look forward to working with you to make fundraisers better for all of us and the earth. Go Friend on Facebook and tell them at Susieqtpies at Scraps of Life sent you! You just might get a surprise! I'm also on Facebook! Stop in and say HI! To enter: Are you involved in fundraisers? IF so why type of products and what group? DO you buy from fundraisers? What do you like buying? Leave a comment below with your email address with this entry. * Tell me something that you would purchase of theirs in a fundraiser. * Order their Fundraising Packet. * Read their Brewing tips and come back and leave a tip that you learned. 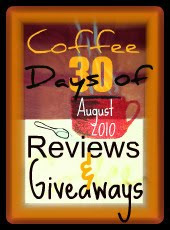 6- Leave a comment on any COFFEE reviews or giveaways or any of my other giveaways, leave a comment here for 5 entries every time. So check back daily all month. 7- Put my coffee or blog button on your blog for 10 entries. Leave link. Cool! I will be switching to organic coffee. I believe that's its healthier plus I am helping mother earth. Also, I agree with you that I am not putting in poison inside my body. I love that! thanks. My church actually sells their coffee and it is so yummy, it is one of my favorite fundraisers. My wife and I like to try different coffees and review them. This one sounds interesting. I usually support youth sports fundraisers. I like buying from fundraisers such as the Girl Scout cookies! I would purchase the organic Very Dark chocolate bars from a fundraiser of theirs. I learned that for the best tasting coffee it is best to use 1-2 tablespoons of coffee per 6 oz of water. SOOOO Excited to have won this prize! The coffee event was a blast to be apart of! !